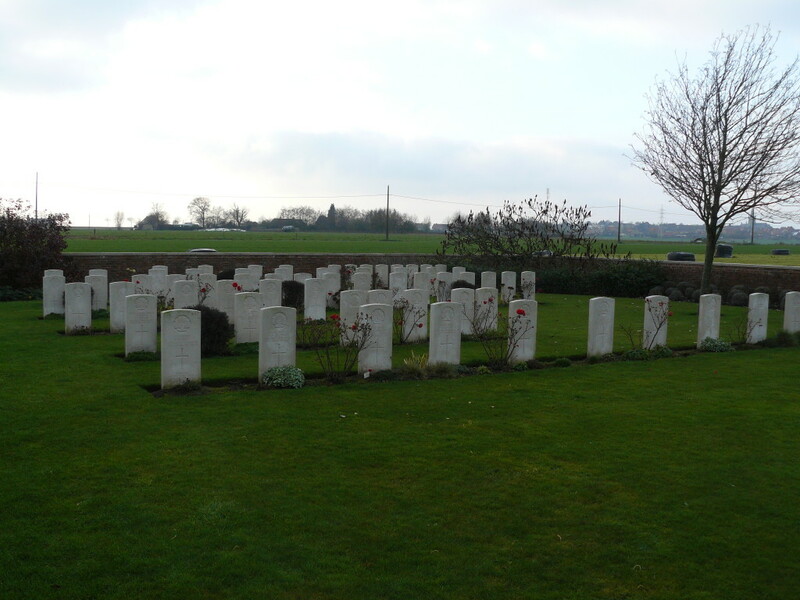 Five hundred yards across the fields, due north from Cabin Hill, Derry House Cemetery No.2 is another battlefield cemetery begun in June 1917 during the Battle of Messines. 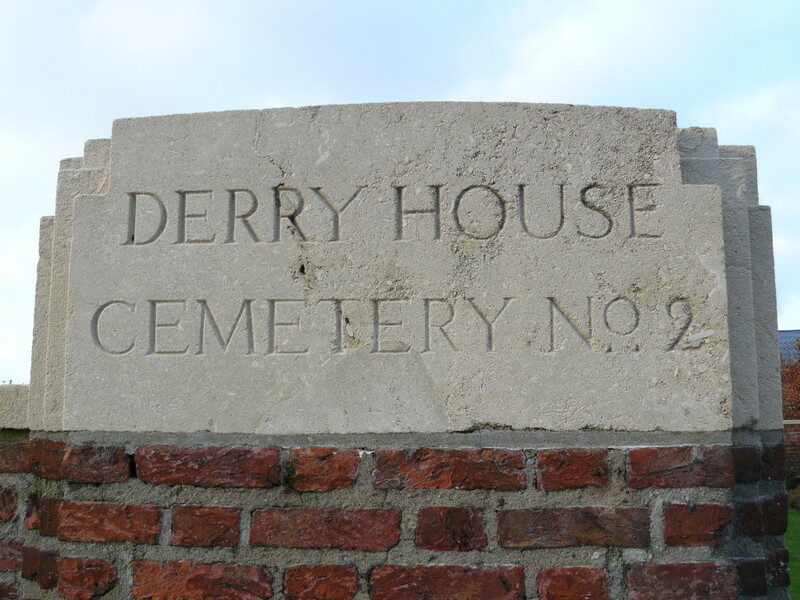 It was begun by a field ambulance unit in the ruins of a farm, referred to as ‘Derry House’ by the men of the Royal Irish Rifles when the 36th Ulster Division took this part of the ridge, and was used on a regular basis until October 1917, and on a handful of occasions later. 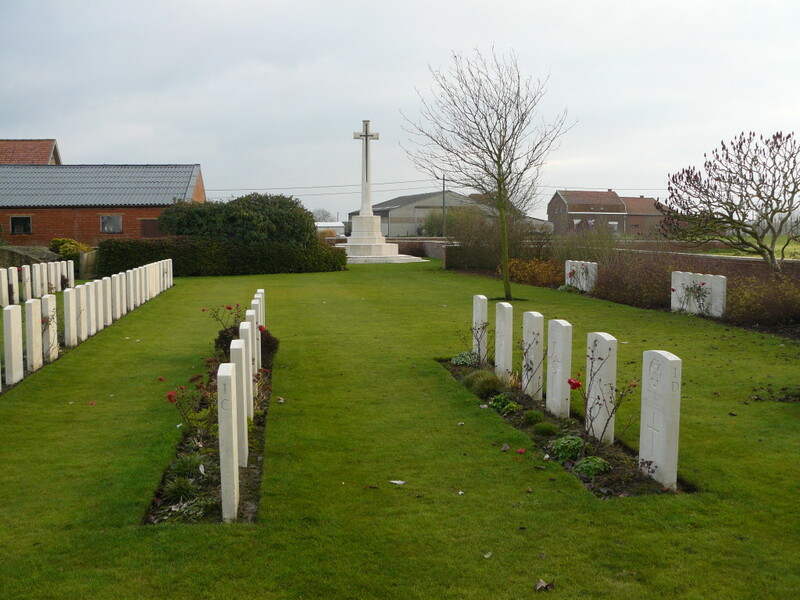 The cemetery is divided into two distinct sections, as you can see if you have a look at the cemetery plan below, courtesy of the CWGC. This is Plot II, on our left as we enter the cemetery, and begun when, for some reason, Plot I was closed down. 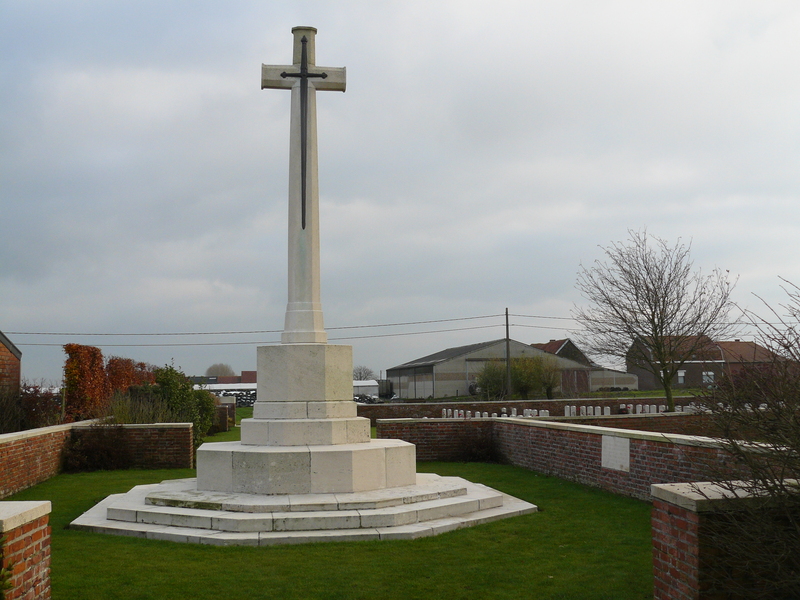 Plot I, as we shall see, is beyond where the Cross of Sacrifice now stands. 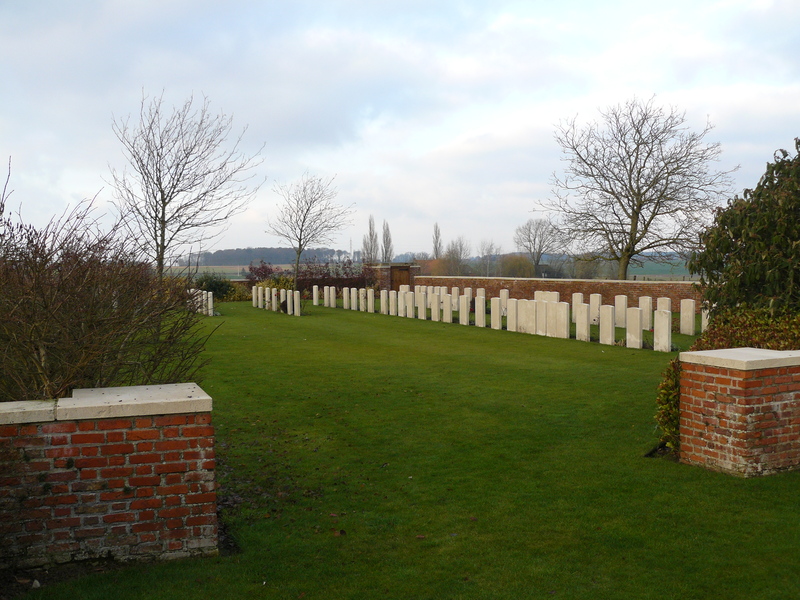 The earliest graves in Plot II, these British & Australians were buried here at the beginning of August 1917. 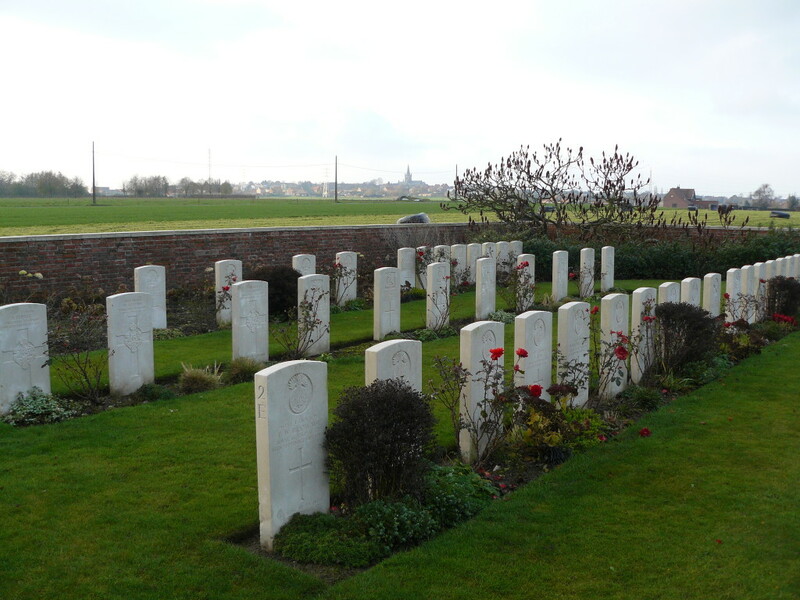 All the burials in Plot II were made between 2nd August and 26th October, except for four Australians graves from mid-December (the four headstones nearest the camera in the back row). 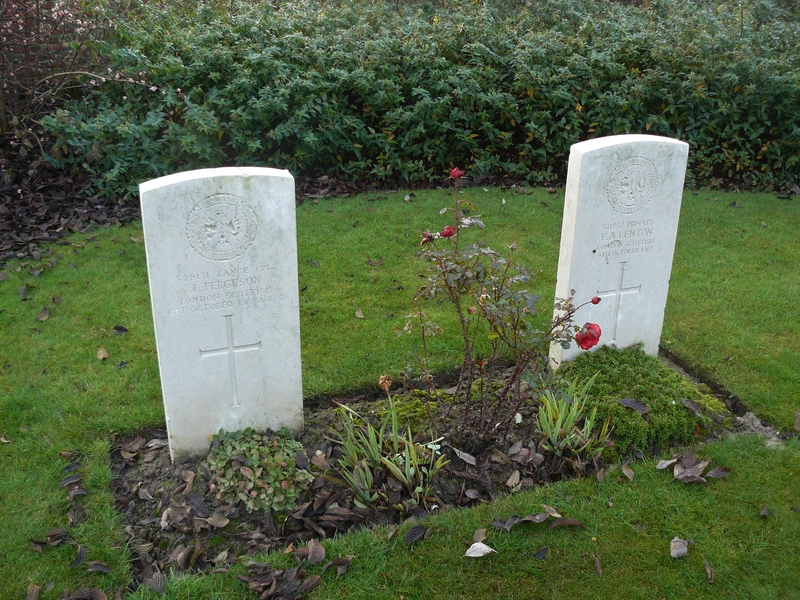 Yorkshire Regiment and King’s Liverpool Regiment graves from late August and early September in Row E.
Plot I. 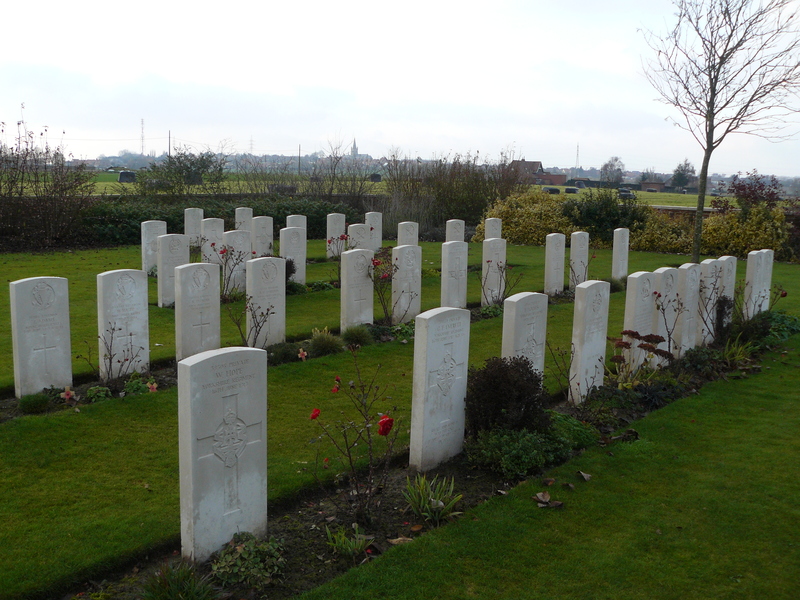 The cemetery contains 163 burials in total, all of whom are identified. 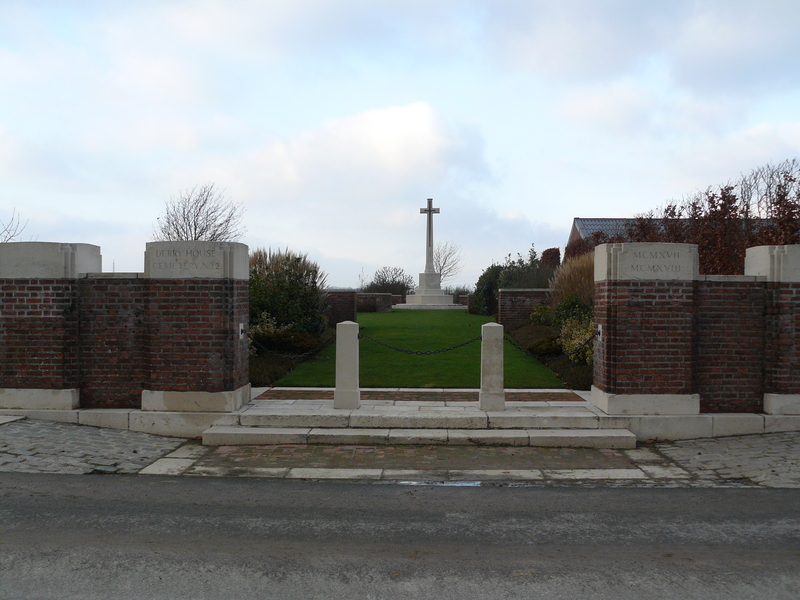 View from the entrance of Plot I, looking back at the Cross of Sacrifice and Plot II beyond. 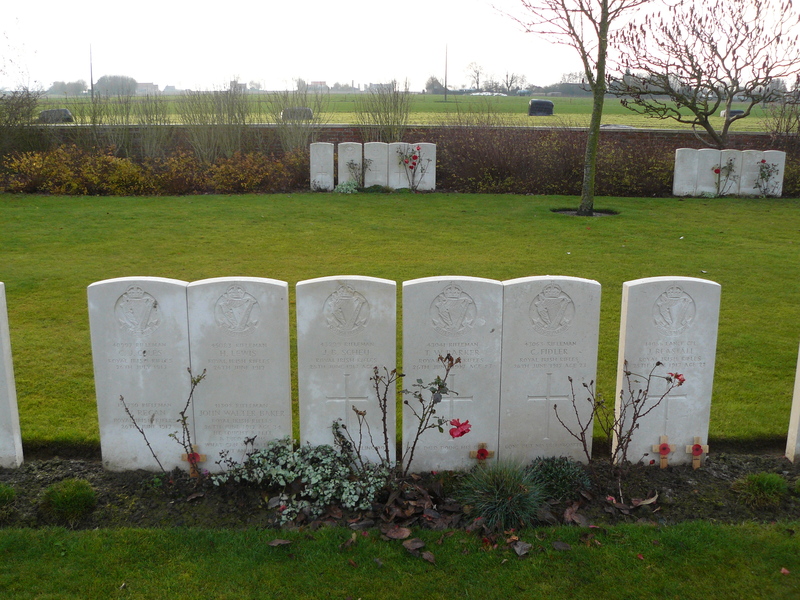 Six men of the York & Lancaster Regiment in Plot I Row A, killed during the final two days of the Battle of Messines. 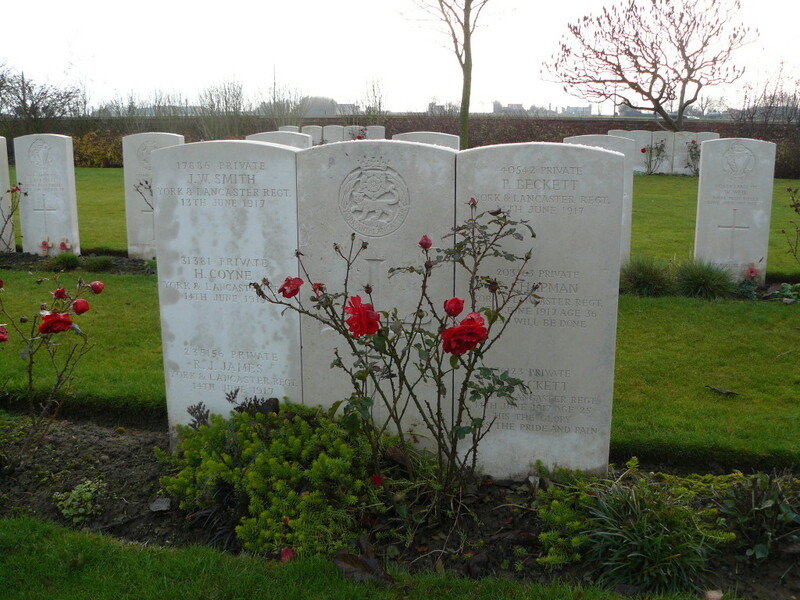 The two Becketts on the headstone to the right were not related. 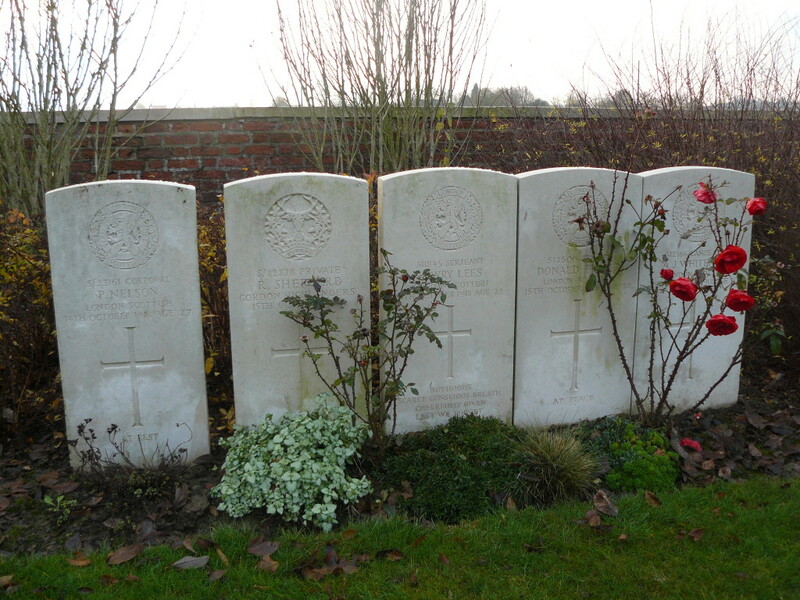 The same headstones are visible in the photo below. 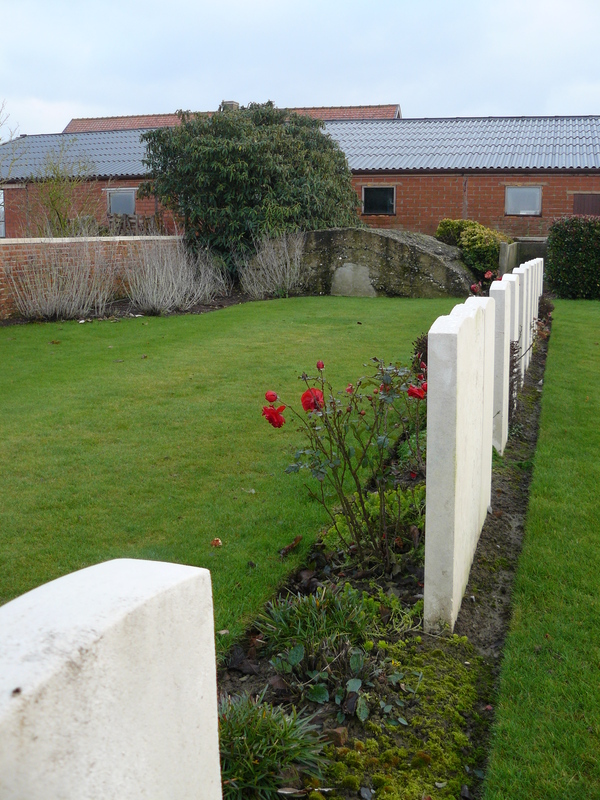 In a corner of Plot I beyond Row A, a British concrete bunker forms the cemetery boundary. Constructed in mid-July 1917 by the Royal Engineers, it was used as a command post for a field artillery battery of the 37th Division. 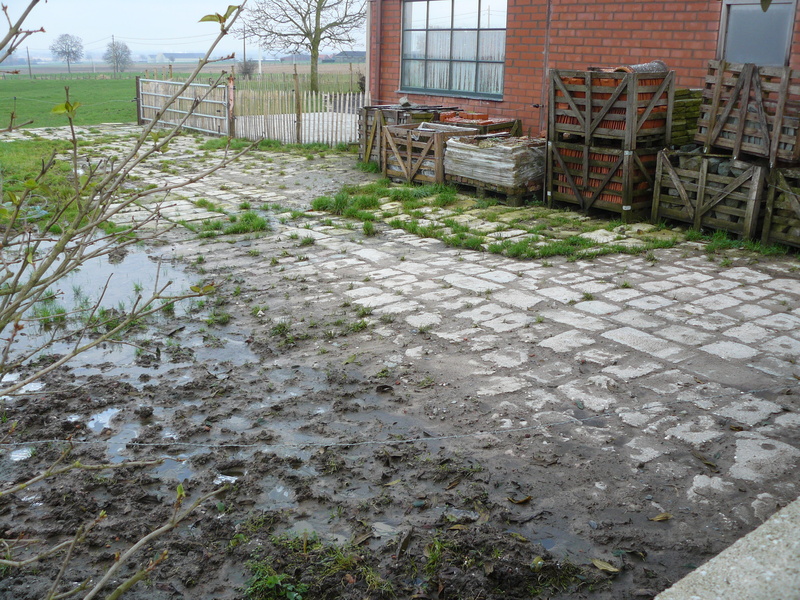 A considerably larger German bunker still resides in one of the adjacent farm buildings, but I’m afraid I was unable to photograph it. 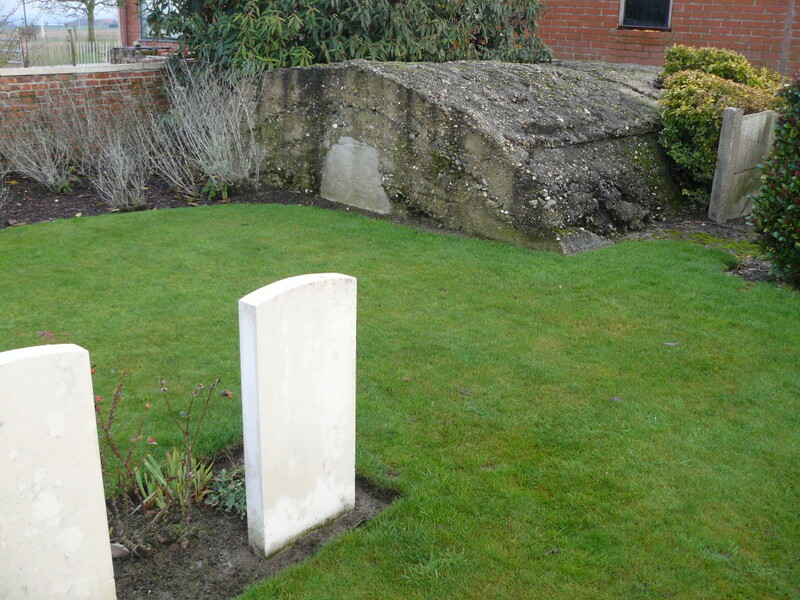 At some point an enterprising farmer has used a number of the prefabricated concrete blocks used to construct the bunker to pave his farmyard, as is evident in the view above, taken looking over the cemetery wall. You can see some of the holes drilled in the blocks where steel bars would be inserted for extra strength. Plot I Rows A (foreground) to E. There is no longer a Derry House Cemetery No.1, and I haven’t found out anything about it, but I do wonder if Plot I was originally Cemetery No.1, which would explain the unusual cemetery layout. 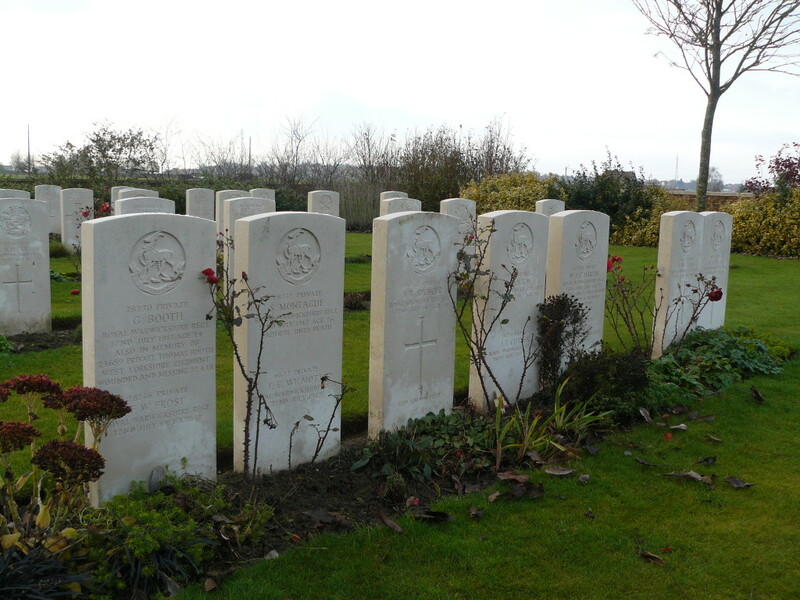 These men of the Royal Irish Rifles, all killed in late June 1917 after the Battle of Messines had finished, are sad proof that, battle or no battle, men continued to die in the trenches on a daily basis. 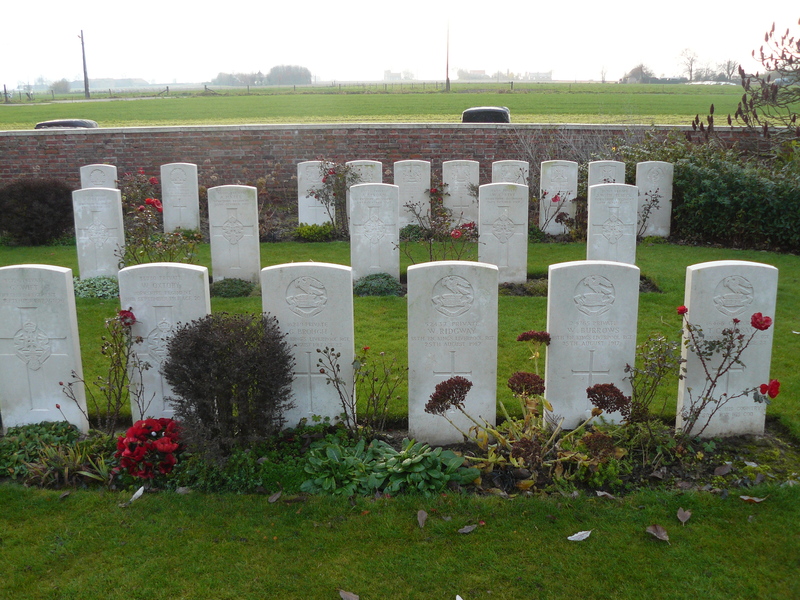 …and then ten days later, on 14th & 15th October 1918, fifteen men (above & below) of the London Scottish and Gordon Highlanders were also buried here. I know not why. 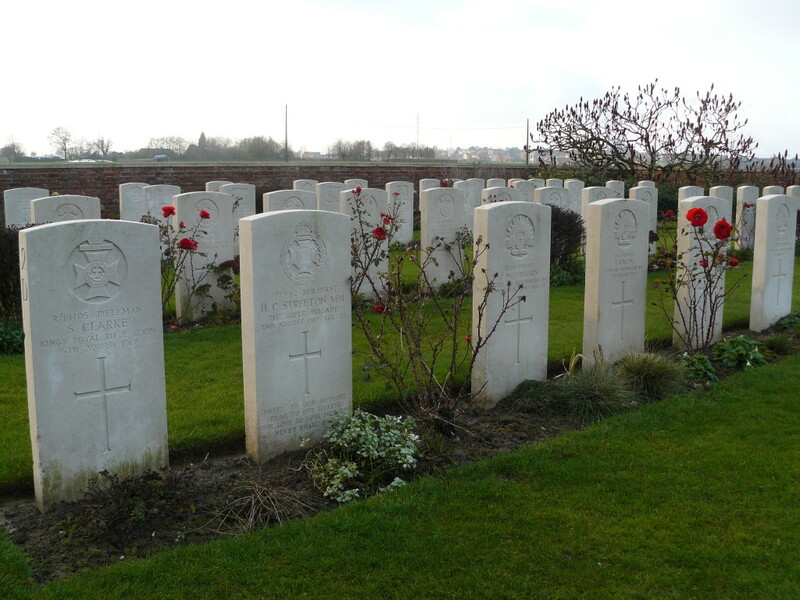 Men of the Royal Warwickshire Regiment in Row A, all killed on 22nd & 25th July 1917. 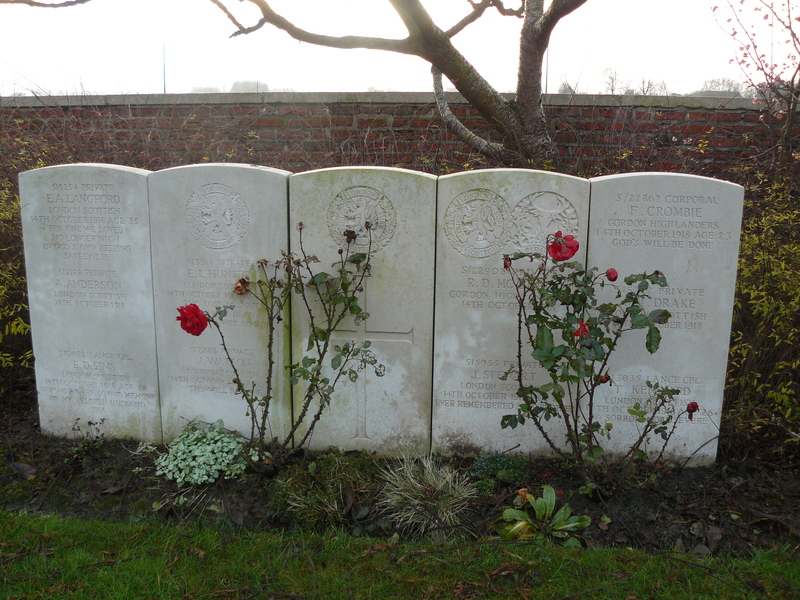 Some of the headstones, you will notice, bear two names, and, in the case of the headstone nearest the camera, three. Private Thomas Booth of the West Yorkshire Regiment is remembered here, where his brother George is buried, although he went missing somewhere in France in April 1918, and his name is inscribed on the Pozieres Memorial. 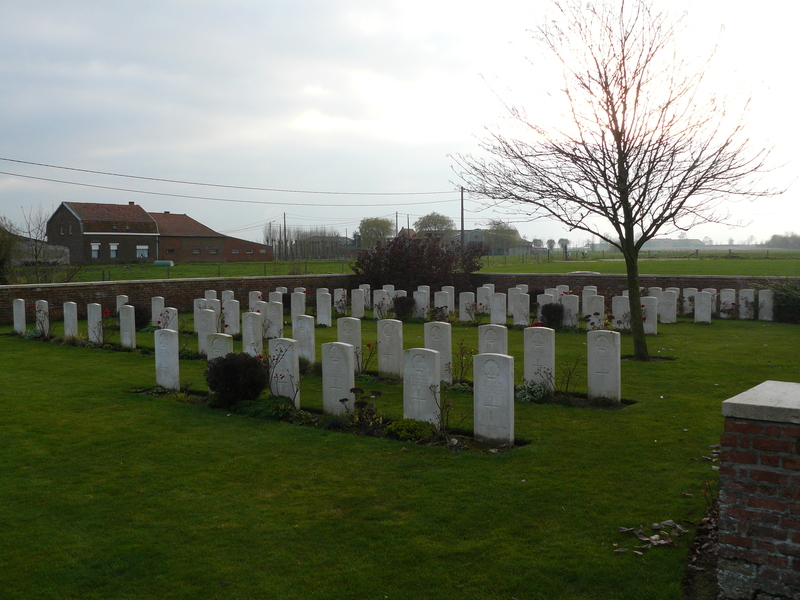 Final view, looking down the length of Plot I from the northern boundary, Rows C & D in the foreground, before we continue our journey a short distance north, where another little battlefield cemetery awaits us. This entry was posted in Bunkers, Messines. Bookmark the permalink. That’s a fabulous story KJ. Thanks for sharing. I intend to visit the Derry House Cemetery, for the first time, in June 2017 on the 100th anniversary of my great grandads death. On scanning down your photos, I was amazed to see his headstone – JW Smith. Thanks ever so much for this website – I have printed a copy of the photo to show my 87 year old mum – his granddaughter. That’s just wonderful Barry. Comments like yours make the all work to put this site together worthwhile. Thanks. Do you know the exact location (address) where you took the picture with the prefabricated concrete blocks? Many thanks. GPS c0-ordinates for the cemetery are: Longitude: 2.900 Latitude: 50.77902. The street is Krommestraat. Best I can do.